GLPrepaid combines the convenience and purchasing power of a reloadable prepaid card with the cost-saving benefits of a long-distance calling card. Prepaid Card: The GLPrepaid card can be prepaid up to $2500/$5000, used to withdraw cash from ATMs, and make purchases both online or in store. The card can be reloaded as needed. 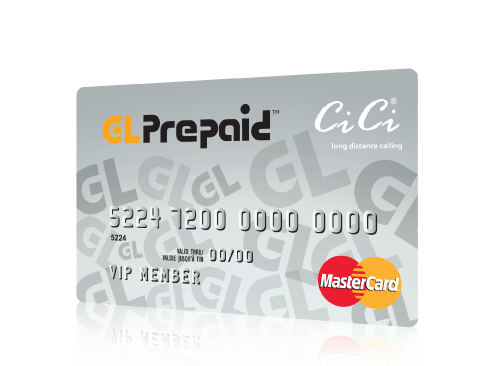 Prepaid Long Distance Calling Card: The GLPrepaid card also offers consumers the convenience and low calling rates offered by a prepaid long distance calling card (CiCi). No bank accounts, No credit checks! GLPrepaid cards can be obtained quickly and easily either by visiting an authorized retail outlet or online at www.glprepaid.com. No ID, no banking information and no credit checks are required. GLPrepaid has no monthly fees*, hidden charges or point-of-sale fees. Immigrants and Newcomers: When a person is new to a country, it takes time to build a credit rating. GLPrepaid card provides users with the opportunity to use a prepaid card as they work to build a solid financial record. The GLPrepaid card is perfect for students who want to gain experience using and managing credit, and for parents who want to teach their children about proper money management. The GLPrepaid card offers travellers peace of mind and limits their financial risk. It also eliminates the need to notify credit card companies of their departure and arrival. This card is also ideal for people who have very few banking products or services. Cashiers at an authorized retail outlet will swipe the card, key-in the desired reload amount, and provide a receipt for your records. Funds are available immediately upon completion of the transaction. Convenient and fast, the card can easily be reloaded via online banking. Funds will be transferred securely from your bank account using your Interac® debit card. Transfer funds from one GLPrepaid card to another GLPrepaid by logging into your account online or by calling Card Services at 1.800.624.6171. Register your card online, then login to your GLPrepaid account to transfer money. Card to card fund transfers are easy, fast, and secure. † Rate for calls placed within Canada & USA (Does not include Yukon, Northwest Territories, Nunavut, Hawaii and Alaska). *GLPrepaid MC: monthly fee applies after 90 days of initial load.